10. 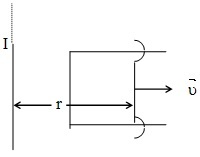 A long straight wire carrying a current I and P-shaped movable conductor bridge arranged in the same plane, as shown in Fig. The jumper, whose length l, and resistance to the R, moved to the right at a constant speed υ. Find current induced in the circuit as a function of the distance r between the ridge and straight conductor. Resistance of the U-shaped conductor loop inductance and negligible.